The first time I tried making ‘nice cream’ (ice cream made from frozen bananas), I couldn’t believe the texture. It was so similar to ice cream, but of course, it was healthy! You can seriously go to town on this nice cream and feel light and guilt-free the next morning. 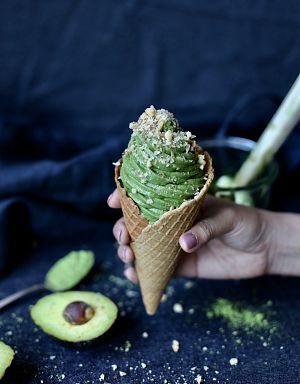 Recently, I discovered that avocados make nice cream even creamier. They also add the healthy, satisfying fats that nice cream was missing. To make this recipe, you’ll need a high-powered blender with a strong motor. It’s a bit of an arm work-out but totally worth it!! Lastly, this recipe is definitely best fresh. Dive in immediately after making! 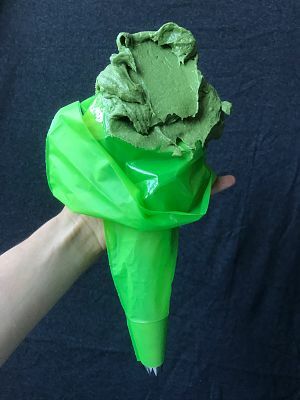 Add frozen bananas, frozen avocados, matcha powder, agave syrup, sea salt and spirulina (optional) to a high-powered blender and blend until creamy. This takes about five minutes and will require some stopping, starting and scraping down the sides of the blender. 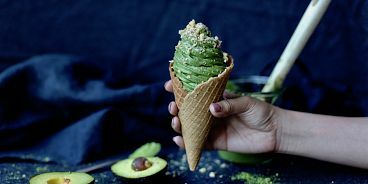 Serve in a bowl or a cone and garnish with desired toppings (walnuts, coconut, mini chocolate chips etc). 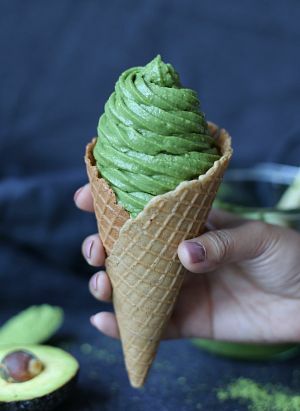 To serve in a cone as pictured, add nice cream to a pastry bag with a star pastry tip and squeeze mixture into cone. Enjoy!! Thanks to Avocados From Mexico for sponsoring this post! All opinions are my own.